IslayBlog.com -> 2009 -> The Scent of Islay? 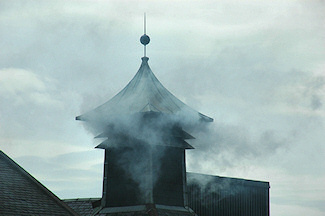 Islay is a peat smoke – the Islay whiskies are all peated to some extent and very distinctive. In other words, Islay whisky is reduced to peat and smoke. While there's obviously an element of truth in it I don't know if that's really all. There's more variety in the Islay malts than just peat, in particular considering Bunnahabhain and some of the Bruichladdich (despite the Octomore). Taking it away from the whisky (or may be even still with it?) Islay smells of much more than just peat smoke to me. The fresh and salty sea air, especially on a stormy day. The sandy yet flowery smell of the dunes and machair on a warm summer's day. I'm sure you can come up with others, similar to the colours? For further reporting and a picture see Smelly bus stops hit the capital. If any of my readers live in Edinburgh, can you test it and leave your impressions in the comments? Twitter about ‘The Scent of Islay?’.